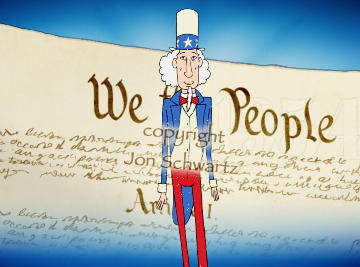 The Constitution Song Animation is the result of an unlikely collaboration between a three-time Grammy-award winning blues vet (Dennis Walker), myself (Jon Schwartz the Rockin’ Teacher, a veteran schoolteacher who specializes in using music to teach kids academics) and one of the world’s best traditional illustrator-animators, Jason Doll of Animation Dog Studios. I wrote the Constitution Song, which is on my CD Tunes That Teach, to get kids hooked on history. Having taught grades 1-6 in public school for 15 years, it always saddened me to see history getting passed over by schools in the high-stakes effort to boost math and reading test scores. I wanted to create a historical teaching tool using music and the visual and performing arts, hence the Constitution Song Animation. To help kids (and people of all ages!) 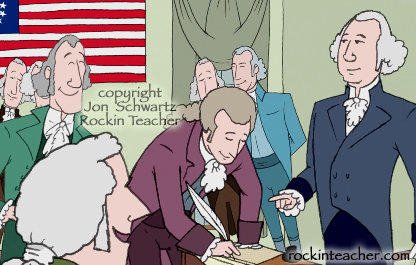 learn about the Constitution, I actually created a whole Rockin’ Teacher Constitution Curriculum that includes dance moves, karaoke, picture books, graphic novels, how-to-draw art videos, and lesson plans. This learning unit is actually already being used in schools as part of a 501(c)(3) nonprofit that I founded called Rockademix. Even with all of the learning materials, I felt we needed something more. Having grown up on Schoolhouse Rock, I sought to create something easily digestible..historical eye candy, if you will, in the form of an animation that could easily be shared and absorbed. I set out to find an old-school illustrator/animator who could bring the song to life onscreen. After scouring the internet for weeks, it became clear finding someone who would commit themselves to the painstaking process of animating The Constitution Song by hand was like finding a needle in a haystack. I didn’t stop looking till I found the right person, Jason Doll of Animation Dog Studios. Like Dennis Walker the producer, Jason Doll became excited in the mission of helping kids learn through the arts. And so began our year-long collaborative process selecting the characters, their looks, and scripting and storyboarding all of the information I embedded in the Constitution Song. We took a lot of time coming up with ways to represent the history, government studies, vocabulary, geography, events, and figurative language in a way that was entertaining, yet also sensitive to the facts. I figured that in the off chance that in the off chance that the Constitution Song Animation became a widely used teaching tool, the imagery had to be consistent with the real history; suppose the drawings and images we put in the video became a child’s primary source for information? With history being edged out of classrooms due to high-stakes testing in mostly Math and Language Arts, every piece of information kids might receive becomes significant. Plus, the animation had to be consistent with the other parts of the Constitution curriculum that I had been creating for my students, and how the song lends itself to teaching and learning opportunities. When Uncle Sam says in the song, “From Barrow in Alaska to El Paso’s Rio Grande” it had to match the dance moves that go with the song, as well as the how-to-draw art videos, maps, and books. At the end of the song, the words read “And time and time again our nation’s problem solved, by sticking to the script from Independence Hall“. 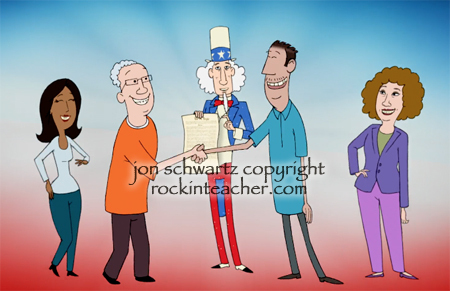 To illustrate this concept, the animator executed a vision I had: Two sets of people would be arguing, and then when Uncle Sam encourages them to consult the Constitution, they find answers to their problems and set aside their differences. The scene seems particularly relevant given the current political climate- especially when the pocket version of the Constitution is flying off the shelves! My hope is that the Constitution Song Animation can help people of all ages learn more about the Constitution and how it can help educate people of all ages and unite our country. If you’re reading this and you have an idea about how we can distribute the animation to reach a wide audience, please contact me. 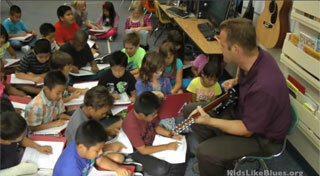 Jon Schwartz the Rockin’ Teacher.